He flies through the air ... Jack Sock returns serve in the second set of the doubles final Sunday at the Delray Beach International Tennis Champsionships. Sock, teamed with James Blake won the match and the title. DELRAY BEACH — One finalist at the Delray Beach International Tennis Championships won his first ATP tournament Sunday, while another came up just short. Both said the experience should give them a confidence boost as the ATP tour moves on this week to Indian Wells, Calif. The American team of James Blake and Jack Sock beat Max Miryni of Belarus and Horia Tecau of Romania 6-4, 6-4 to take the doubles tournament, giving Sock his first career victory. The two had teamed up to make to the finals of the U.S. Indoors National Championship in Memphis a week ago. In the singles competition, “accidental” finalist Edouard Roger-Vasselin of France lost to Ernests Gulbis of Latvia 7-6(3), 6-3. It was Roger-Vasselin’s first career final after playing in his first career semifinal the night before. Sunday’s victory for Team Blake/Sock doesn’t necessarily represent the start of an ongoing partnership between the two. Blake said he will play with Mardy Fish at the BNP Parabas Open in Indian Wells this week, and he doesn’t see himself extending his career — he’s 33 — by becoming a doubles specialist. Both Roger-Vasselin and Gulbis will be facing qualifying matches when they arrive in Indian Wells but both have reasons to be more confident than they might have been before Delray. Roger-Vasselin was in France the Friday before the tournament and hadn’t planned on competing in the ITC until receiving an invitation to the main draw literally at the last hour when other players dropped out. He beat the tournament’s top seed, John Isner, ranked 15th in the world, Saturday night to get to Sunday’s final. “It was a great week for me so there are a lot of positives for me to remember,” Roger-Vasselin said. Gulbis, who won his second Delray tournament in four appearances, had to win three qualifying matches, then five matches in the main draw. Along the way, he beat third-seed Sam Querrey and second-seed Tommy Haas. He came into the match ranked 150,000th in world as he put it (actually 109th) with the aim of using the tournament as a springboard to get his career back on track. He’s exceeded his own goals, which were to crack the top 100 by April. The standings released after the tournament have Gulbis at 67. “Honestly, I didn’t believe I could play well this week. 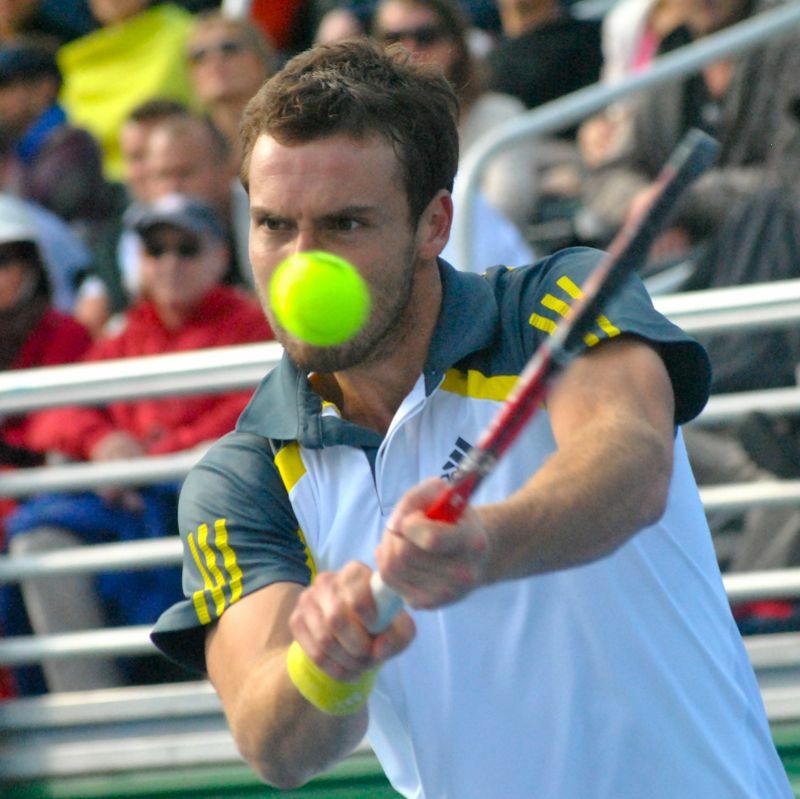 It’s been a really good start of the year,” Gulbis said. “I feel really good about it. We didn’t think it was going to happen so fast. 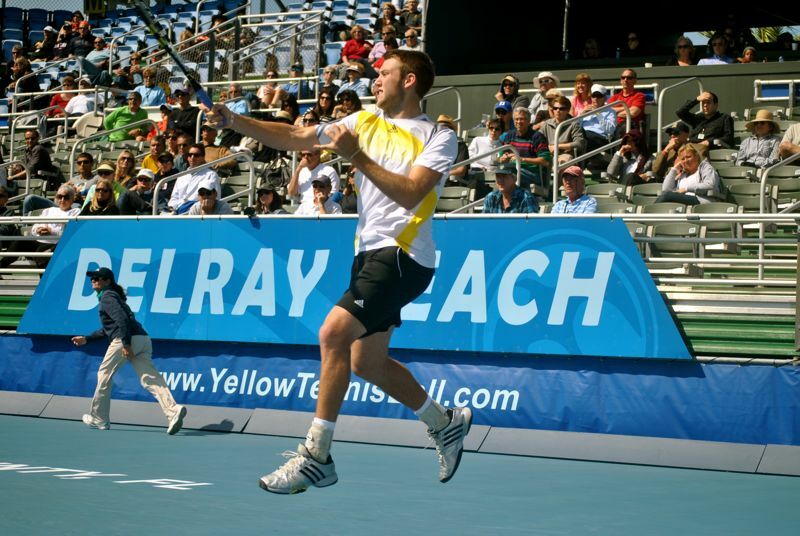 NOTES: The Delray Beach ITC will begin a week earlier in 2015, starting, appropriately enough, on Valentine’s Day. 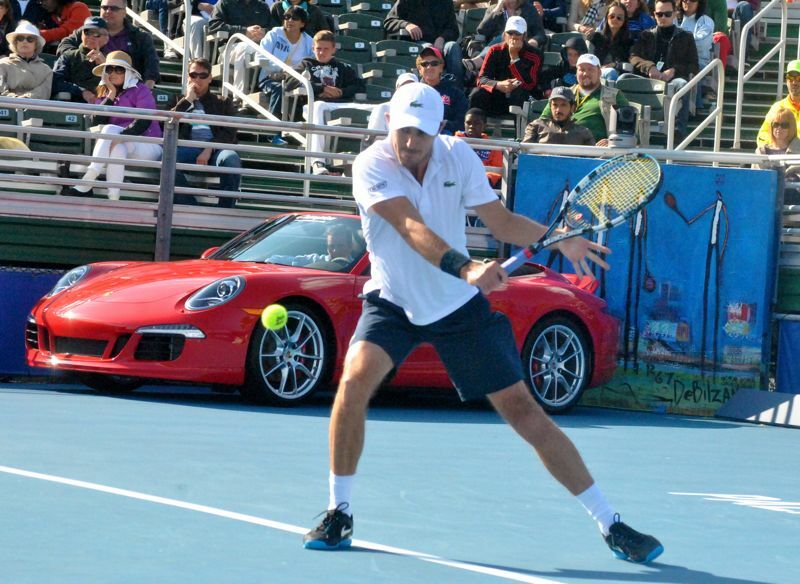 … During the trophy presentation, Gulbis asked if the Porsche convertible that’s been parked in the corner of the stadium all week was his for winning the tournament (it’s not). Later, he explained that his manager kidded him for not asking about it when Gulbis won the tournament in 2010. His favorite car is a Mercedes but he said he was willing to switch. “I could be bought,” he joked. … The Blake/Sock team took home $25,000 for winning the doubles competition … Gulbis earned $78,000 for winning the singles title, while Roger-Vasselin took home $41,100 as the runner-up. ... Max Mirnyi was going for his third double title at Delray. He won in 1999 partnered with Nenad Zimonjic and in 2009 with Jamie Murray. Keeping his eyes on the ball ... Ernests Gulbis in his finals match against Edouard Roger-Vasselin of France. Gulbis won. Backhand ... Edouard Roger-Vasselin Sunday afternoon. 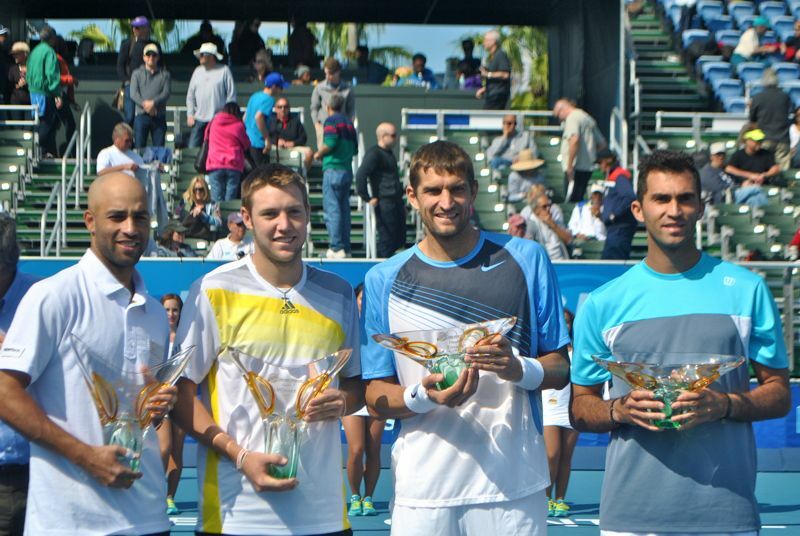 James Blake, Jack Sock, Max Mirnyi and Horia Tecau with the trophies. 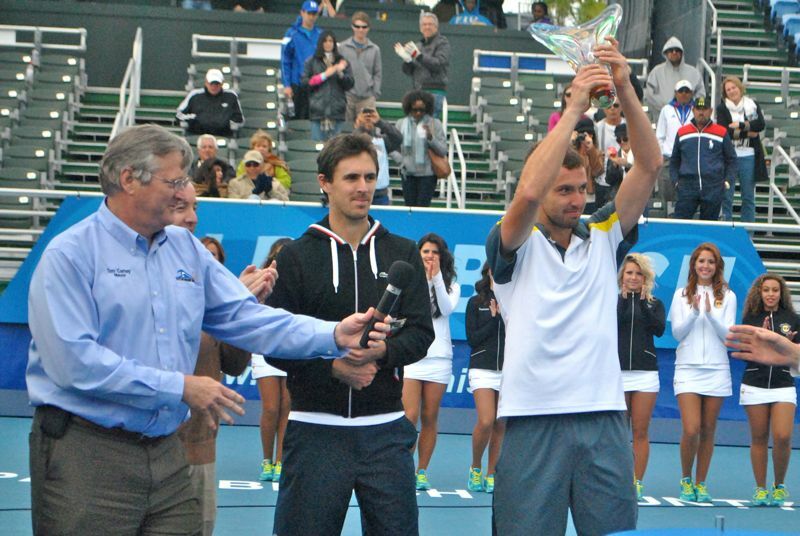 Delray Beach Mayor Tom Carney with Edouard Roger-Vasselin and Ernests Gulbis during the trophy presentation Sunday. Delray Beach City Commissioner Adam Frankel is slightly behind Carney.